Most Americans are happy with their families — so why is there so much judgment about other people's choices? Americans think their families are doing pretty well, but they think other people are screwing things up. That's a major takeaway from this year's American Family Survey, an annual nationwide poll created by the Deseret News and the Center for the Study of Elections and Democracy to track trends in people's family lives and attitudes about relationships and families. As was the case with last year's survey, researchers found that while most people think their marriages and families are stable or even getting stronger, when asked about other people, they think those fools are falling apart. Researchers found a similar discrepancy when respondents were asked about their families. A whopping 87 percent of respondents felt their families were stable or getting stronger but 34 percent of those surveyed felt that other people's families were weakening. 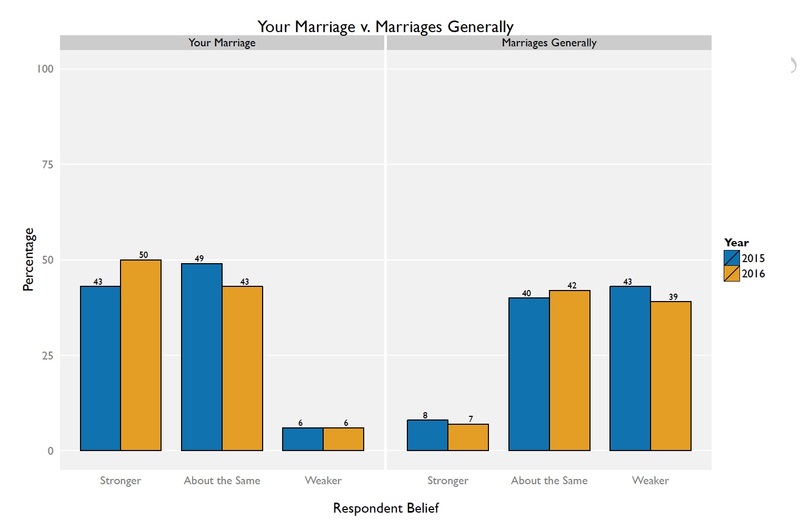 Americans "feel good about their marriages and families, for the most part," Christopher Karpowitz, the co-director of the Center for the Study of Elections and Democracy at Brigham Young University, explained in a phone interview. "It’s the disparity between how they feel about their own relationships and families and how they see everyone else’s relationships and families that’s interesting." “It just points to the way people can be quite judgmental about a number of things," agreed Jeremy Pope, the center's other co-director. 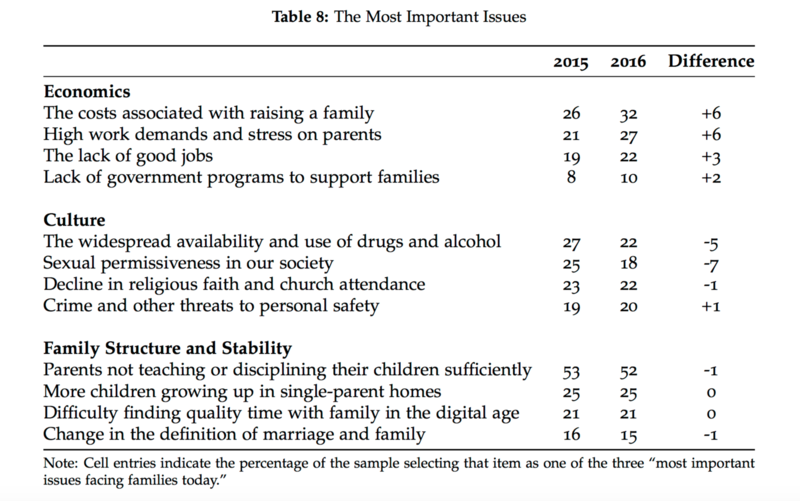 Pope pointed out another question in the survey had asked respondents about what they think are the most important issues facing Americans today. Even though researchers found that 4 in 10 of the Americans in the study have faced serious economic challenges in the past year, respondents were still more likely to rate poor discipline for children as a more serious problem for families than economic problems. "What they mean by that is that other people are not disciplining their children," Pope cracked. The most headline-worthy change the researchers found was about the timing of marriage and childbearing. "Over 90 percent of parents over age 65 were married when they first had children, but only 30 percent of those younger than 30 were married when their first child was born," the researchers wrote. "In addition, younger people tend to have different attitudes about the meaning and value of marriage. Though they do not oppose the idea of marriage, they are more likely than their older counterparts to believe that personal commitment to a partner is more important than the legal fact of marriage." Karpowitz and Pope hastened to note that there's not a lot of information out there about what this shift means for Americans and getting a handle on the impact of this shift will require more research. But the ugly fact of the matter is that, for years now, Republicans have been arguing that non-marital childbearing is the cause of every social problem you can imagine, from poverty to gun violence. Republicans have grown increasingly attached to the notion that marriage is a cure-all for all that ails you. In June, House Speaker Paul Ryan and a Republican-led task force on poverty released a report called "A Better Way to Fight Poverty" that purported to offer a superior alternative to the social safety net. Rather than receiving food, shelter and health care, Ryan argued that lower-income people need to keep their knickers on and get married as quickly as they can. Marriage is one component of what has been called the “success sequence”: three key achievements that are associated with low poverty rates. People who graduate high school, work full-time, and delay having children until they are married are much less likely to live in poverty. Only 2 percent of people who do these three things are in poverty, compared to almost 80 percent of people who have done none of them. Unfortunately, our current welfare system may be exacerbating this problem, as many means-tested welfare programs penalize marriage — because when low-income fathers and mothers marry, their combined income from welfare and wages will almost certainly be lower than the amount they had separately. This sort of rhetoric has a clear electoral appeal because it justifies cutting spending and appeals to the older Republican demographic. As the American Family Survey has found, older Americans are more likely than younger Americans to think there's something wrong with having children outside of marriage. But this overly simplistic attitude about marriage is not justified by the evidence. 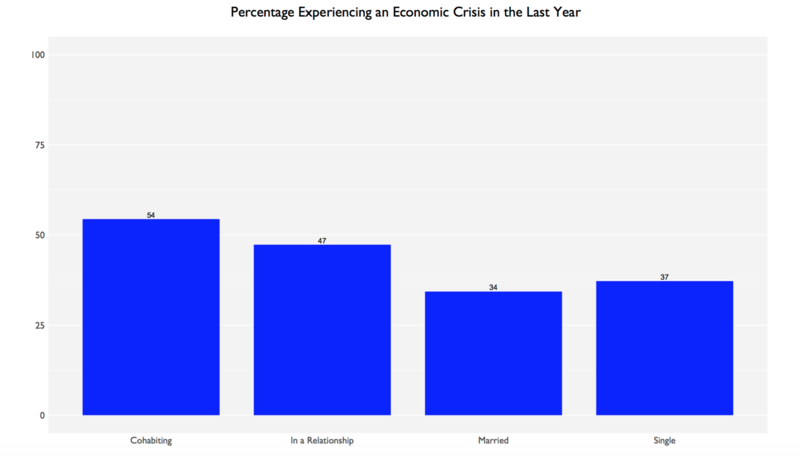 The American Family Survey did find that married people were less likely to have had an economic crisis in the past year than people in a relationship or cohabiting. As Pope explained, however, "You should not attribute much causality to anything in the study because causality in the area of family life is extremely difficult to measure." Pope also pointed out that the differences between different groups were not as significant as conservative rhetoric might lead you to believe, as shown by this chart. There's probably a bit of the chicken-and-egg dynamic when it comes to the relationship between marriage and financial stability. Marriage may make people more stable, but people might wait until they're financially stable to get married. "Young people have a sense that they should wait until they’re more financially stable," Karpowitz said. "Older generations didn’t necessarily do that. They were more willing to jump right in." He noted that this tendency to wait might also explain why people in their 20s who have children are so much less likely to be married than in previous generations. In other words, if you do have a kid in your 20s, you are more likely to not be married. But it's also quite possible that more people are putting off childbearing until their 30s, after they have established themselves in a career and married. One thing's certain is that younger generations are not shunning marriage, as conservative rhetoric often implies. It's possible that this great respect for marriage is why people are marrying later in life, even if that sometimes means having kids before they make the leap. Young people take marriage seriously and want to make it work. Taking your time and making sure you have the right person and right financial setup make it likelier that your marriage will be a strong one. "Though an important goal of this report has been to describe the objective public opinion about family and family policy," the report concluded, "we do believe that American families of all types would be normatively better off if they understood one another better."